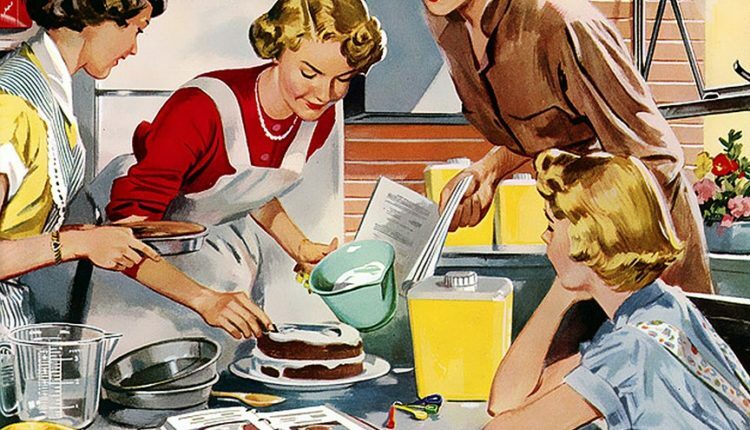 In May of 1955, “Housekeeping Monthly” published an article entitled, “The Good Wife’s Guide,” detailing all the ways that a wife should act and how best she can be a partner to her husband and a mother to her children. I appreciate the fact that we have come so far that we can roll our eyes and laugh at such a concept. However, it’s also helpful to remember how women were treated and expected to act on a day-to-day basis. Have dinner ready. Plan ahead, even the night before, to have a delicious meal ready on time. This is a way of letting him know that you have been thinking about him and are concerned about his needs. Most men are hungry when they come home and the prospect of a good meal is part of this warm welcome needed. Prepare yourself. Take 15 minutes to rest so that you’ll be refreshed when he arrives. Touch up your makeup, put a ribbon n your hair and be fresh-looking. He has just been with a lot of work-weary people. Be a little gay and a little more interesting. His boring day may need a lift. Clear away clutter. Make one last trip through the main part of the house just before your husband arrives, gathering up school books, toys, paper, etc. Then run a dust cloth over the tables. Light a candle. Your husband will feel he has reached a haven of rest and order, and it will give you a lift too. Prepare the children. Take a few minutes to wash the children’s hands and faces (if they are small), comb their hair and, if necessary, change their clothes. They are little treasures and he would like to see them playing the part. Minimize all noise. At the time of his arrival, eliminate all noise of the washer, dryer, dishwasher or vacuum. Try to encourage the children to be quiet. Better yet, have them in bed. Don’t greet him with problems or complaints. Don’t complain if he’s late for dinner. Just count this as minor compared to what he might have gone through that day. Make him comfortable. Have him lean back in a comfortable chair or suggest he lie down in the bedroom. Have a cool or warm drink ready for him. Arrange his pillow and offer to take off his shoes. Listen to him. You may have a dozen things to tell him – the moment of his arrival is not the time. Let him talk first. Make the evening his. Never complain if does not take you out to dinner or to other places of entertainment. Instead, try to understand his world of strain and pressure and his need to be home and relax. And this is now. Thankfully we are beginning to develop into a society that recognizes equality between genders. Although we still have a ways to go. There’s still an expectation for women to maintain the household and raise the children, despite also working full time outside the home. But, hey, we came this far in 60 years. I wonder how far we’ll go in 60 more.